A&A Coatings is a unique plant devoted exclusively to the application of metal, ceramic, cermet and hard faced coatings. Years of experience with these processes led to the development of Cerami-Pak® coatings for the packaging industry. These coatings are a special family of ceramic fluorocarbon composite materials developed specifically for the film and packaging industries. Cerami-Pak® coatings provide superior wear resistance, release, low coefficient of friction, excellent corrosion resistance and unique hot slip surfaces. Furthermore, Cerami-Pak® coatings can be applied to any base metal. The surface can then be easily cleaned and is long lasting (in excess of 10 years in some cases) in spite of regular wire brushing or scraping. Over 50 years of field experience prove that Cerami-Pak® coatings are superior to plating, stainless steel, Teflon tape and other surface coatings or treatments for high wear and/or high temperature surfaces. Initial R&D on Cerami-Pak® coatings began in 1965 to help overcome the problems encountered with new plastic overwrap films developed for the cigarette industry. Today, every manufacturer has benefited from our company’s coating development. Thousands of sealer bars, plates, rails and heaters have been coated with Cerami-Pak® coatings, extending the life of these critical parts. 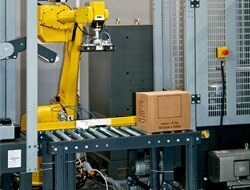 Special formulations and texturing techniques allow modern plastic films to be sealed while increasing production rates and cutting costs. A&A Coatings has coated package machinery parts of every major manufacturer – Scandia, FMC, MIRAPAK, Hayssen, Sollas and Package Machinery, to name just a few. We are also coating and restoring essential packaging machinery assembly for users, as well as OEM’s, leading to extended part life, higher production rates, and less downtime. These parts typically have been covered with Teflon sheets or Teflon impregnated glass fabrics. Cerami-Pak® coatings eliminate these costly and frequently replaced alternatives with a coating that offers superior wear resistance, hot slip, release, and heat conductance. These parts, which guide or form film webs and packages, are subjected to constant abrasive wear. Cerami-Pak® coatings extend the lifespan of these parts much longer than the original polished or plated parts. The added benefit of low C.O.F. also insures superior performance over the “slip” of uncoated surfaces. The benefits of wear resistance, good release, and excellent corrosion resistance provide superior performance and longer useful life of these parts over other coatings, or original metal. Cerami-Pak® coatings resist attack from inks, acids, and solvents in film coatings. A PTFE coating developed for the packaging industry. For those applications where slip and release characteristics are desired and the hardness of 1101 or 1107 coatings are not necessary. Recommended for use on flexible sealing components, molds, corrosion resistant applications and other components. The original Cerami-Pak® coating developed for the Packaging industry imparting high slip and release characteristics of Teflon combined with high hardness and wear resistance of Ceramic. 1101 has excellent release Properties at elevated temperatures. Recommended for use on crimping jaws, heat sealing bars, tuckers, blister sealers and other components. This coating was developed to replace textured Teflon coated fiberglass tape and eliminates the need to machine grooves or slots in packaging machine parts. The standard 1107 coating provides an “Orange Peel”, textured surface, imparting higher hot slip characteristics than Cerami-Pak® 1101, while retaining all other characteristics. Recommended for use on formers, filling tubes, transfer plates, wear plates, heat-sealing bars, sealer plate surfaces and other components. Due to the unique requirements of different industries, A&A Coatings has developed many different types of coatings to solve specific and unique problems. Our engineering department will assist you with recommendations to solve your problems utilizing Cerami-Pak® coatings or one of the hundreds of other coatings we offer.